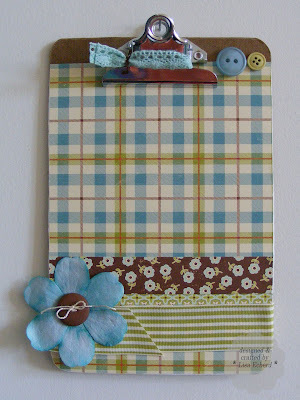 For today's tip, I'm sharing my latest stab at shopping lists for my scrap items. I've tried a notebook, little notes that inevitably get lost on my desk and end up as scrap glue paper, and other strategies where I always forget things or end up with so many lists I don't know where to start. Finally this weekend, I took a small clipboard and turned into a list gathering place for needed items. Will it make me more efficient in using those Hobby Lobby coupons for needed adhesive rather than a fun embellishment? We'll see. Hopefully it will make shopping as quick and easy as this project. These matching papers from October Afternoon match my bedspread and coordinated for a quick job. Since the paper matched the clipboard, I didn't worry about covering the top near the clip. I cut the papers close to the size of the clipboard and adhered them with spray adhesive. Then I sanded the edges with an emory board. The flower is a white Petaloo flower dipped in diluted Baja Breeze classic ink. I added several coats to get it the desired color. 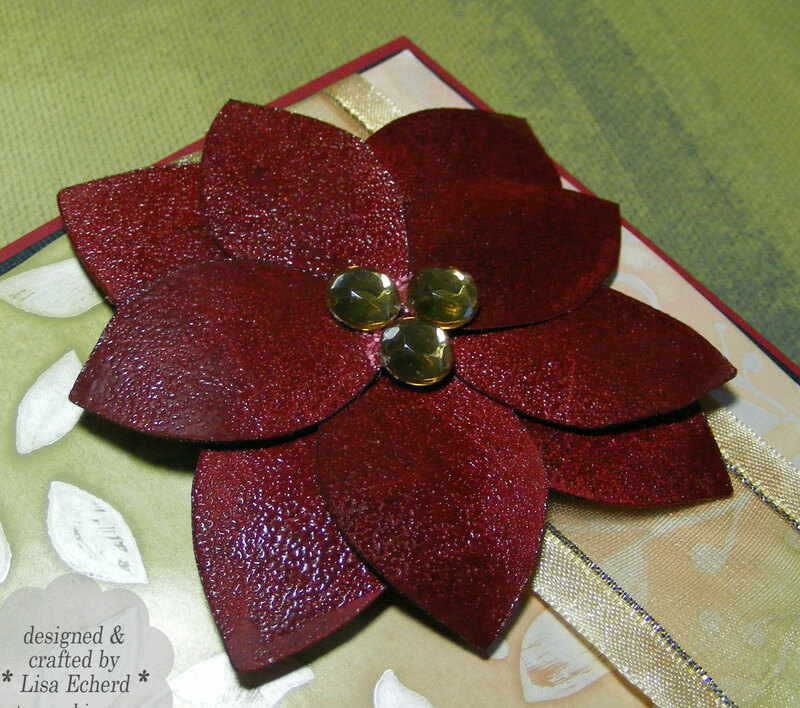 To adhere the flower, I drilled two small holes and ran a thread all the way through the chipboard and ribbon. The other buttons are adhered with glue dots. The ribbon on the clip covers up the names "Staples" on the clipboard. 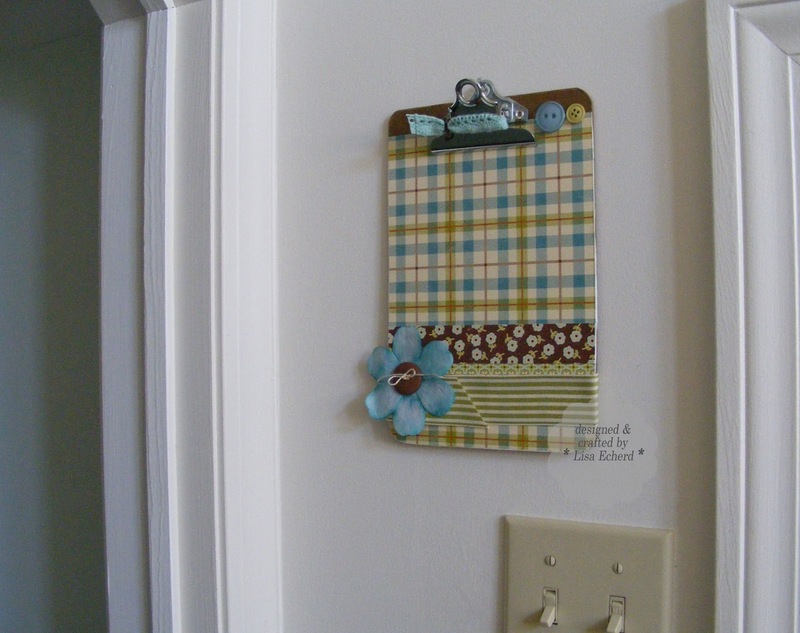 Now the clipboard hangs by the door of my guest bedroom/craft room. I have notes on it already with things I need to buy or add to my next Stampin' Up! order. 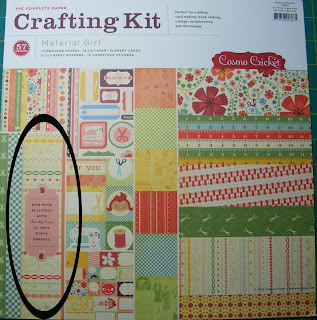 How do you keep up with your craft shopping wish list? 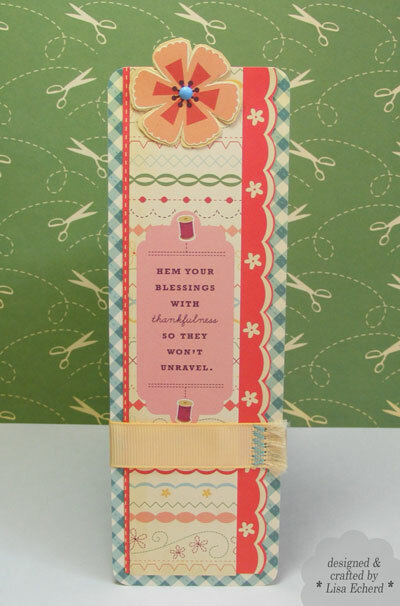 Ribbon: Dear Lizzy from American Crafts; Old Olive by SU! Welcome to my second video! We made this card in our last stamp class at my house. I don't make many tags and wanted to give a little more life to this tag stamp that was part of a hostess set from Stampin' Up! You could use any tag stamp or small image stamp. You could also change the colors of the "package" and theme of the tag and make this into a birthday card. 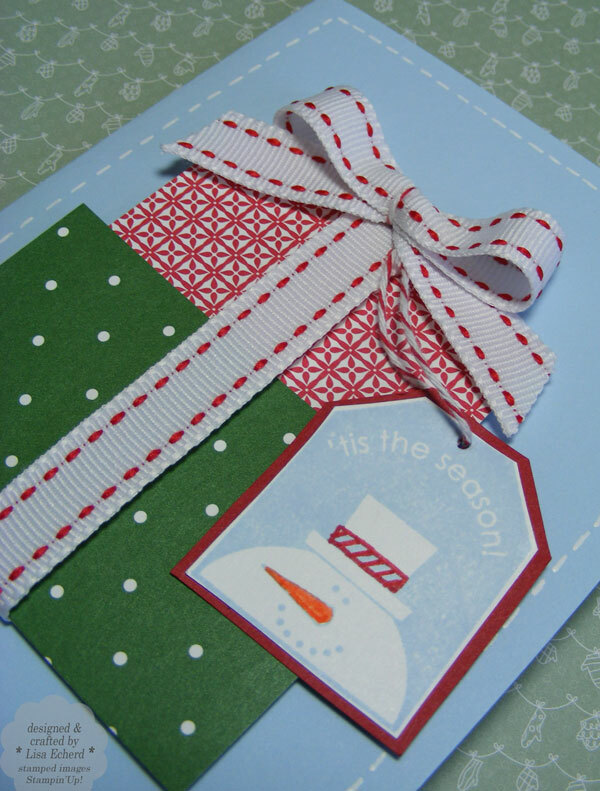 Cardstock base: 5 1/2" x 8 1/2"
Scrap cardstock: 3 3/4" x 5" and 2 1/2" x 3 1/4"
Designer paper for package: 2 1/2" x 1 1/4" and 3" x 2"
Ingredients: Stamps: Christmas Punch by Stampin' Up! 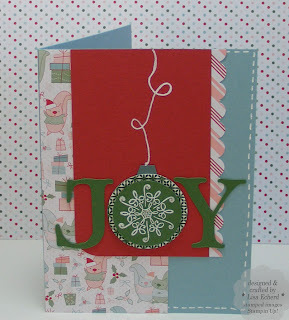 Here's an all Designer Paper card using the Candy Cane Christmas designer paper from Stampin' Up! 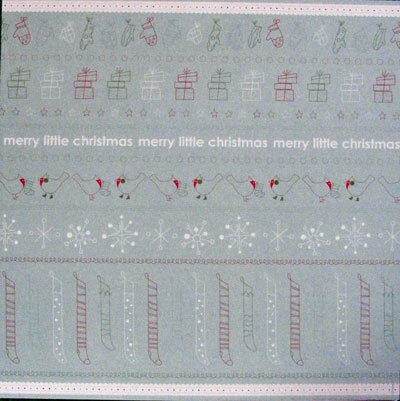 I fell in love with this paper and got the matching stamp set and the buttons, too. I've had some issues though using all three together as the elements don't seem to be in proportion. The stamps are small designs, the papers kind of medium to large and the buttons seem really huge. Since I need to make myself about 15 more cards I'll be tackling this problem in the coming days. 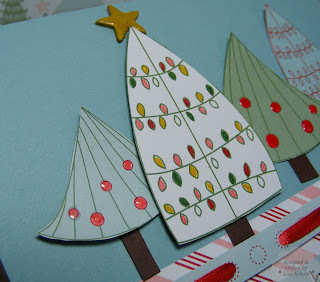 In the meantime, this card just uses the paper with the trees cut and and some color added with markers. I also went over a few of the dots with Ranger's Glossy Accents. The star is SU! 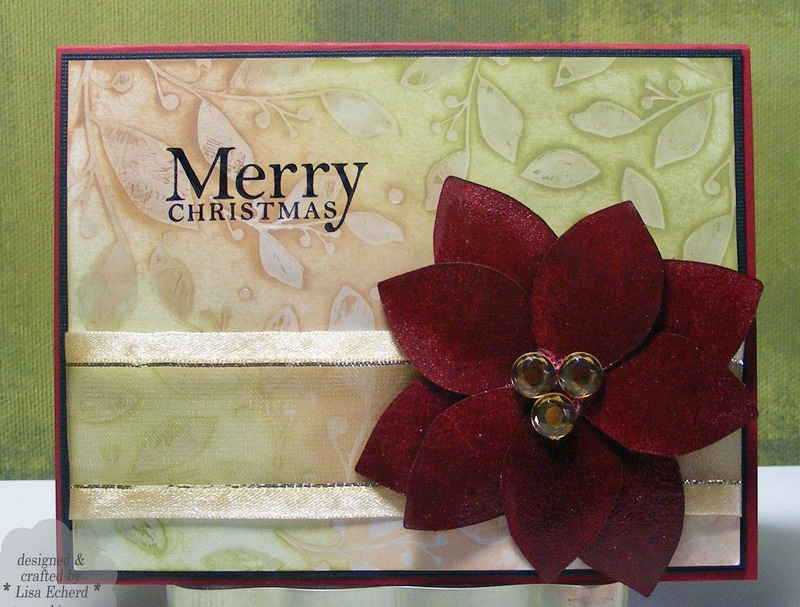 chipboard colored with Crushed Curry ink and more Glossy Accents. 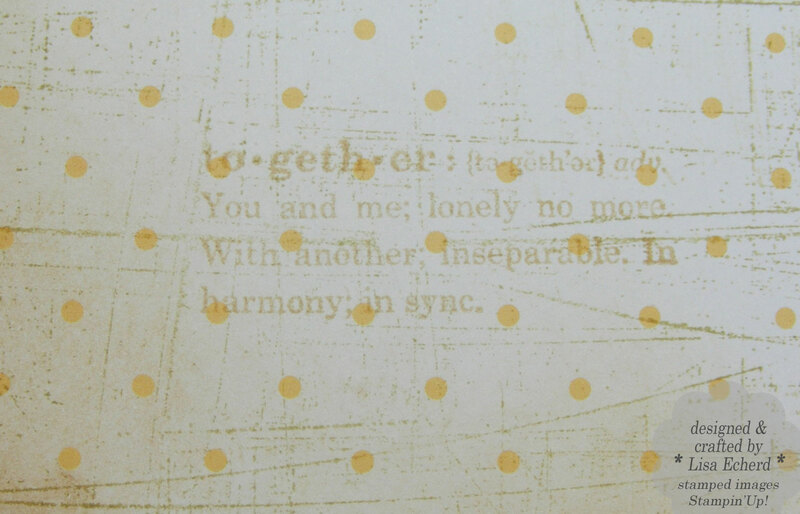 Even the sentiment is cut out of the paper and gone over with a Zig marker which has a thinner line than SU! markers. Coloring, cutting and punching are just other ways of using our pretty designer papers. I just filmed a new video for another Christmas card yesterday. Hope to have it up and posted no later than Monday. Thanks for visiting! Ingredients: DSP: Candy Cane Christmas by SU! Mother's holiday cards are finished! Yippee! I really enjoyed making these and I was equally glad to get them wrapped up and handed over to my Mother yesterday. I posted a similiar card as this a few weeks ago. The background is from Jennifer McGuire's Holiday Thinking Inking class at http://www.twopeasinabucket.com/. I believe this was week 3 or 4 of her videos. All are still available. Currently we are on the last week of the class. 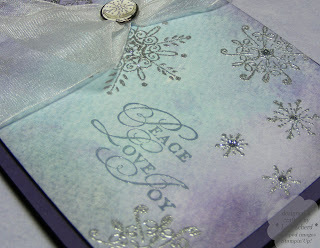 For the foreground I stamped and embossed the snowflakes in silver and then added some Stickles also in silver for the centers. When I showed Mother the first one, she exclaimed, "where did you get that button?" It's a Build-a-Brad from stamping up. I'm loving these more and more because they are very easy to make and you always get a matching brad since you stamp your own center. Now on to my holiday cards. I've made a lot of them in ones and twos for challenges and stuff. Now is time finish up because it will soon be time to mail them! 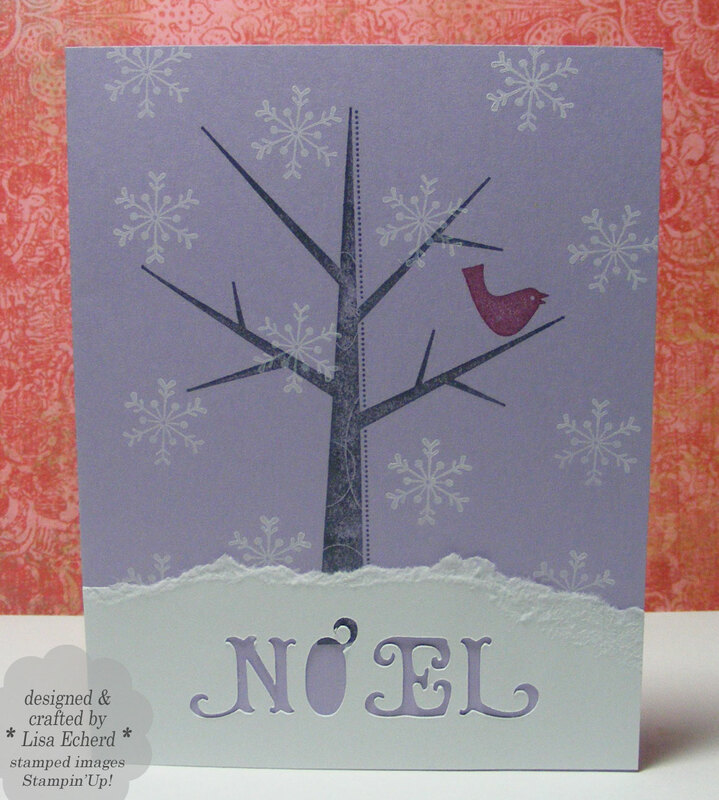 Ingredients: Stamps: Serene Snowflakes and All Holidays for greeting from Stampin' Up! 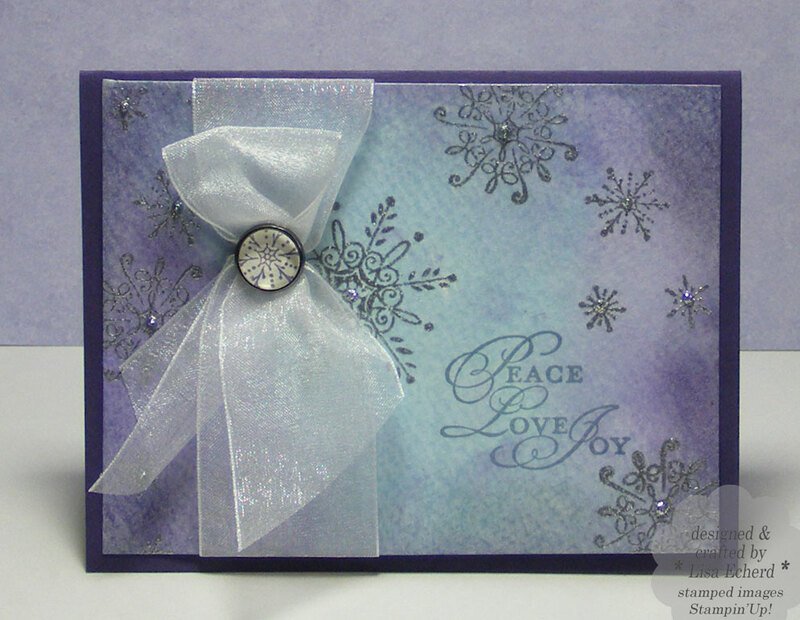 Cardstock: Elegant Eggplant from SU! Brad: Pewter Build-a-Brad from SU! AddictedtoScrapbooking and AddictedtoRubberStamps have everything marked down. Check the shipping costs as these can run a bit high. Last year I got some good deals even with the shipping cost. Two Peas In a Bucket has free shipping on purchases of $25 or more, no code required. They also have a lot of current product on sale. Stampin' Up! also has some current product marked down and free shipping on $150 which is where you would qualify for hostess benefits. There are a few teasers out there, too. Scrapbook.com (which I've never shopped at but looks like they have huge selection) is planning a 12 days of Christmas sale starting December 1. While you are buying groceries and getting out all the dishes, don't forget to get another important ingredient ready - your camera. It's easy to get caught up in all the food and other traditions and forget to take those precious photos. Sometimes we see people at the holidays that we don't see any other time of year. For my family, that isn't typically the case as Thanksgiving and Christmas are just immediate family. We typically have other family gatherings in the summer. However, I do usually have a holiday party of some sort. And I'm bad to forget to take photos! It's true. 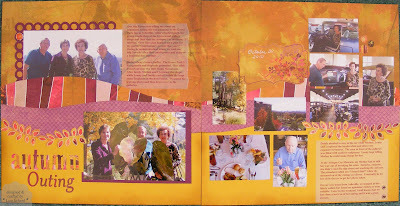 I love to scrapbook but remember the camera after the guests have left. One recent year, the camera was sitting on the mantle the whole evening not capturing everyone's good times. Change or charge the batteries. Think about what photos you want to capture and start early. Ask someone to take some pictures for you so YOU will also be in the pictures. Besides two heads remembering to use the camera are better than one. Get photos of your preparations - shopping, cleaning, setting up, cooking, baking and all your helpers (hopefully you have some.) The photo below is a Project 365 shot of an old recipe I remembered that would give us a 'non-traditonal' pumpkin dish to please both me and my husband. Capture the rituals as well as the posed shots. What is it that makes the holiday memorable for you? In doing Project 365 this year, I've really noticed how these little everyday things I've captured bring back memories when I look at the photo months later. Hope you have a wonderful Thanksgiving for those in the US! Happy on-line shopping to all! Are they great books about cats or great cats written about in books? Both! Oscar is billed as an ordinary cat with an extraordinary gift. My husband thinks what Oscar does is morbid. The author believes Oscar is a true comfort to his 'patients' and their families. Oscars gift is being with his patients in their last hours. He is a nursing home cat and he seems to know when a person is about to pass on. He is a sign to families that it is time to finally say goodbye to loved ones who have often been in ill health for years. All of Oscar's patients have dementia. And it is in telling the story of these patients and their families that makes this book a must-read for everyone. I hope you never have to spend any time in a nursing home as a patient or family member. Yet most of us are likely to at some point with someone we love. I've encouraged my husband to read Oscar's story more for what it tells us about the medical care system for the elderly than for a cat with a special gift. The Norton books are wonderful treats about a man who professes to hate cats until a girlfriend gives him a delightful Scottish fold kitten. It's love at first sight. The man who knows nothing of cats thinks that he can just take Norton along with him wherever he goes like people do with dogs and thus begins Norton's adventures here and abroad. Norton meets celebrities (Harrison Ford, Sir Sean Connery), lives in France for a year and is terrified of birds. He is a delight. 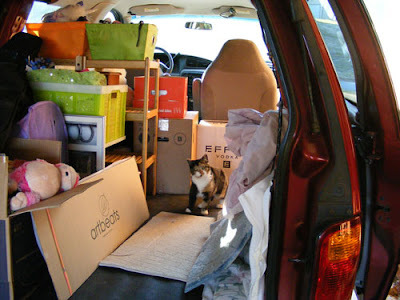 And speaking of kitties, see the curious calico in the middle of my van. Her counterpart, a gold tabby had just left the van before I snapped this photo. I was helping a friend move and her kittens couldn't help but see what we were up to. We made sure they were accounted for before we pulled away with loads of boxes. The kittens will travel separately to their new home. It's a gorgeous day here in NC. After finally being rid of our colds, my husband and I are off to take a walk together. Thanks for stopping by! It seems like reading goes in spells for me. I've always got books check out. Sometimes I'm powering through them and sometimes I can take forever to get through one book. Lately, I've covered quite a bit of ground so it seemed like time for a new bookmark. Hopefully, I'll get my Shelfari list (below) up to date soon and blog about some of my favorite reads. But tonight I've got to get this post up and get off to bed soon. I'm helping a friend move tomorrow. For the main part of this bookmark, I used a section of the paper pack's cover sheet. I had already used this element before on a card and just loved it. A smaller version was found on the cover sheet. I then backed it with papers from the rest of the collection. A very simple bookmark that can remind me to count my blessings. Appropriate for November! Thank to you for stopping by! 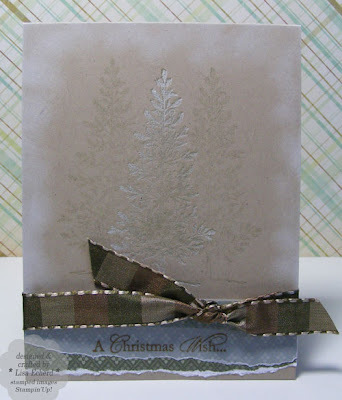 Ribbon: So Saffron by Stampin' Up! My husband needed to borrow my laptop for a couple of days. I suffer withdrawal when my computer is out of reach. What can I do? Well, I could clean my house but what fun would that be? The subject of this page is very true. Never let a man buy a pressure washer. They (the pressure washers) suffer from the same curse as all motorized outdoor equipment such as lawn mowers and weed eaters. They are guaranteed to break down at least once per season resulting in extreme frustration and large outlays of cash. The Pressure Washer, a.k.a. the money pit, is only still intact and not smashed to smitherins by a sledge hammer because... we don’t own a sledgehammer. Every year, it takes days of fiddling and often expensive parts to coax it into starting and running long enough to wash about two thirds of the house before some other part gives up. Why did I think this year would be any different? Why did I think we could clear off the porch on a Monday and get the everything back in less than a week from Tuesday? Lenny worked diligently pruning, repairing, carrying, shopping and washing. I helped where I could making many trips to the hardware store, fussed a lot, mopped and finally admired a sparkling clean house. 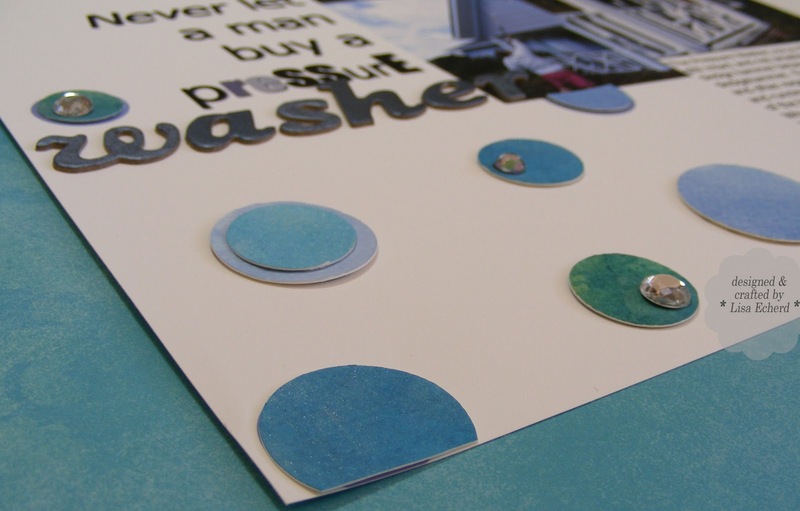 I added simple blue/gray colored circles in various sizes to the background of the layout in Photoshop Elements. These served as place holders so I could work out an arrangement for the 'drops' on the screen beffore printing. The actual circles are cut from watercolor paper inked with spritzed Ranger distress inks. I'm really loving the technique from Jennifer McGuire at Two Peas. A few rhinestones finished off the layout. The word 'pressure' is in various fonts and shades of gray to mimic how uneven the pressure in the washer can be when it refuses to work properly. It may not be all wine and roses around here but it isn't dull. Thanks for visiting! Ink: Ranger distress inks in Peeled Paint, Tumbled Glass; Not Quite Navy by SU! Rhinestones: Jewelry dept at Hobby Lobby. Here are a few of my October photos for Project 365. For this month, I'm organizing them according to subject rather than by week. This post was supposed to be yesterday's tip on backgrounds but since I'm late anyway, I'll digress into leaves. The leaves above were created using some of Jennifer McGuire's inking techniques. I inked my acrylic blocks in distress inks. Rather than spray with water, I used Angel's Glimmer Mist. Then I pressed the block onto photo paper. I chose photo paper because it would be easy to spread the ink around and also it is thin. I knew punching the leaves would be too difficult out of watercolor paper. The effects were gorgeous although the colors came out much lighter than I expected. 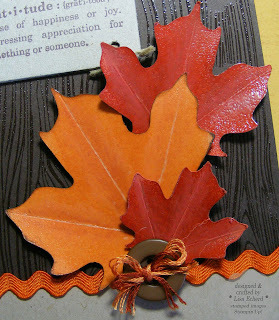 For most of the leaves, I used a little distress ink on the edges. 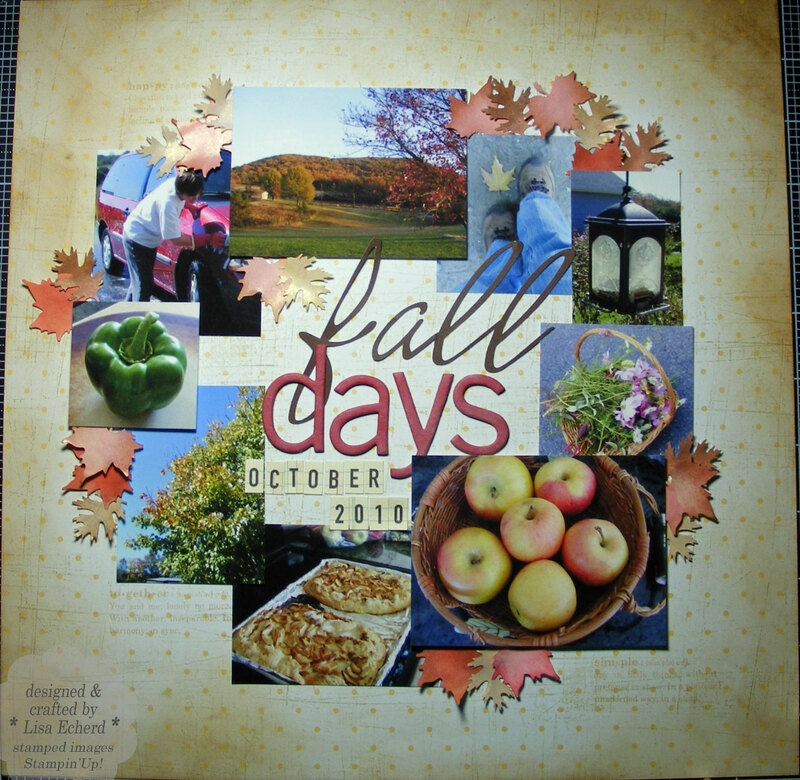 Over the weekend I was looking for a background designer paper for this fall page. I wanted something fairly simple, neutral color but with a little interest. The best fits in my stash were pages allocated for other projects or too 'pink, blue' or well, something. It's like when you look in your closet full of clothes and lament: "I don't have a think to wear." Sometimes you just don't have the right paper. Stamp with a background stamp in a neutral color without much contrast to the small print in the designer paper. 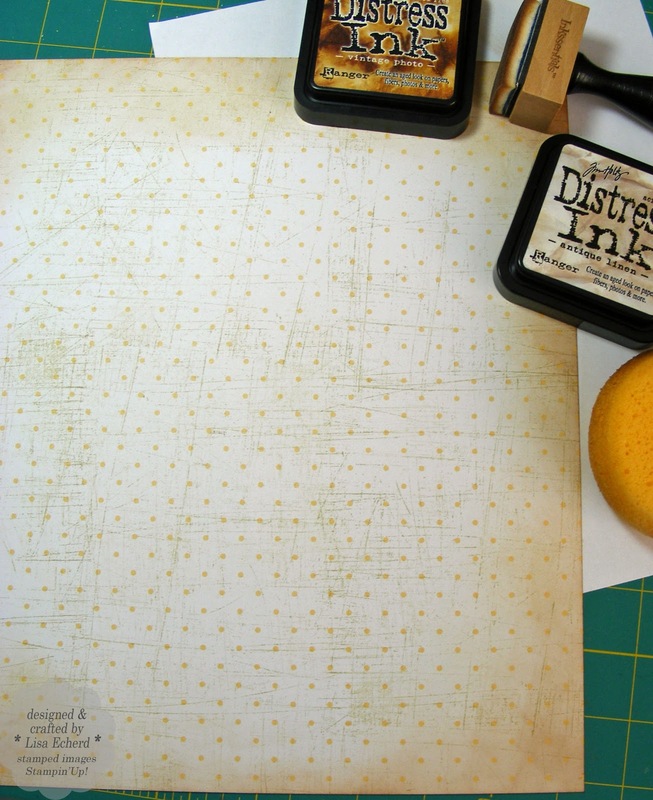 My paper had So Saffron dots so I used River Rock to stamp with the Sanded background stamp. Distress the edges starting with a darker shade on the outside and a lighter shade just inside the dark edge. (I got that tip from Jennifer McGuire at Two Peas). 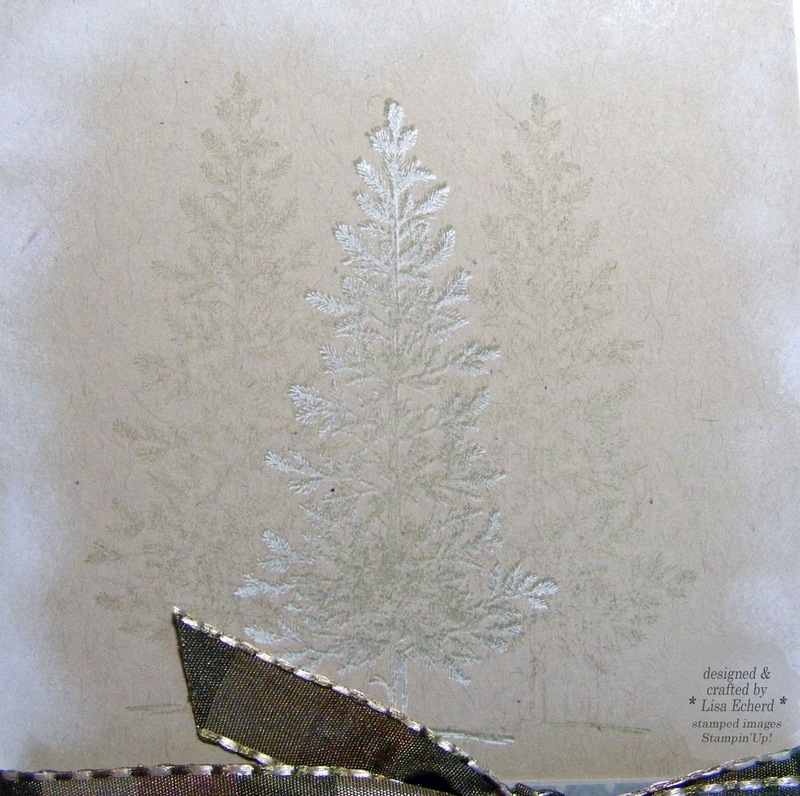 I used Vintage Photo on the outside edge and then some Antique Linen just inside that edge. 3. 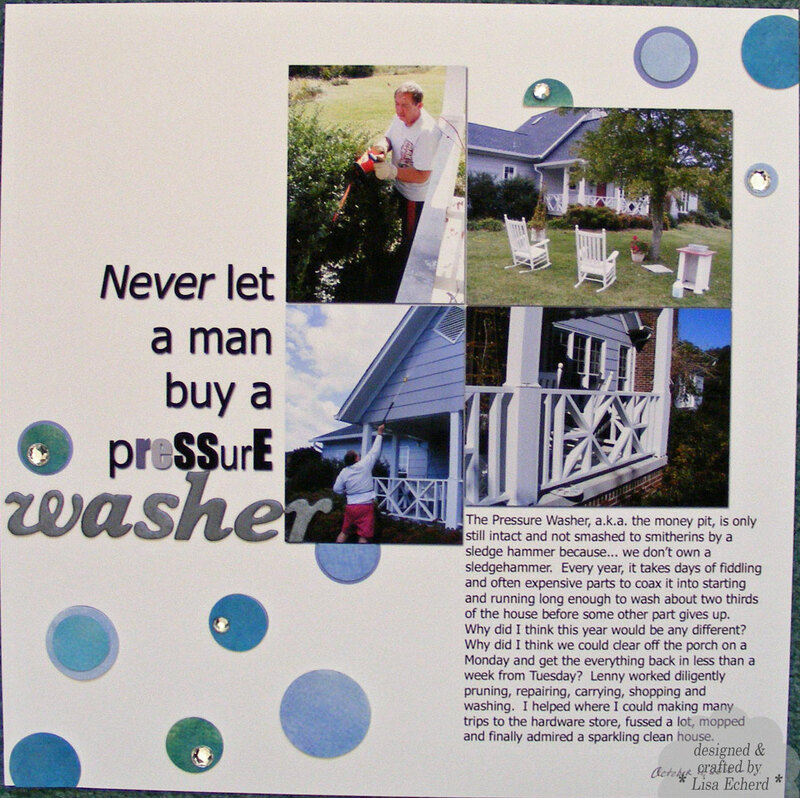 To finish off the page, add some lightly stamped text images. 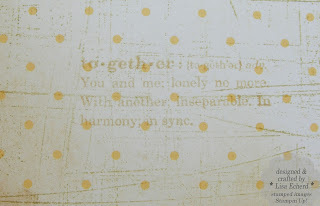 I used Antique Linen to randomly stamp these definitions from the Define Your Life set. For a fancier page, you can stamp lightly with flourishes or brocade type images. 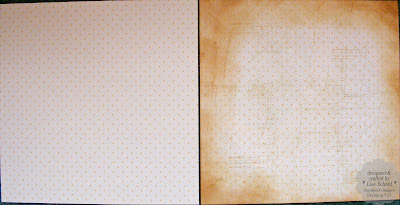 Makking your own distressed background paper really stretches your stash and gives you the colors you want for your pages. It also let me put those words in places they could be seen in the layout. Ingredients: Stamps: Sanded, Define Your Life by Stampin' Up! DSP: Sweet Pea from SU! Hi! Due to a nasty cold, work and lots of other obligations, I don't have my tip up today. Please check back on Wednesday. Thanks! She is through 2 of the 5 weeks of holiday card videos. There are also giveaways with these this year so stop by for a look. For my version, I used the Cricut to cut my J and Y letters. My ornament is stamped and embossed and cut out rather than cut from pattern paper although one layer is a SU DSP in Garden Green. The red section is a little shorter than her version as I wanted to show off that pretty paper in the background. Ingredients: Stamps: Serene Snowflakes by SU! Lately, I've really been working my circle cutters. 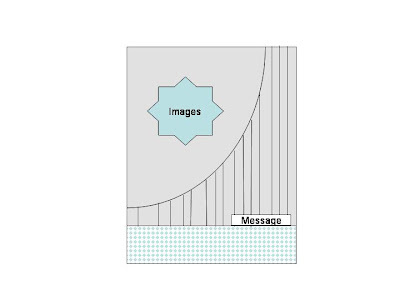 In this case, it is the negative image that forms a frame for the stamped elements. The large flower is stamped in Versamark and colored with pastels working from the center out. You often have to go quite a bit deeper in pastel shades to get what you are looking for. The outside edge is actually Bravo Burgandy. For the first version I of this card I stamped, I reached for Colorbox chalk inks for the background flowers since these were from acrylic stamps. But not for these acrylics. Stampin' Up! Classic actually worked best. I've now labeled this stamp set so I know what ink to use with it. A couple of weeks ago we had a very enjoyable day out with my parents as a belated anniversary present for them. We enjoyed a buffet lunch at the Grove Park Inn in Asheville and then browsed the Grovewood galleries beside the Inn. It had been many years since any of us had been there and they have really added a lot to the Inn. The food was a delicious as ever. My Dad loves buffets and you can't get more sumptuous than the Grove Park's. 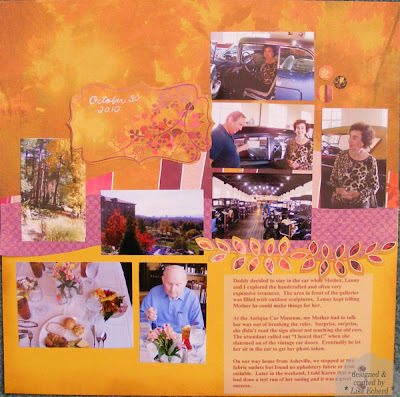 My friend Karen was planning just such an outing for a group and I used her itinerary for a wonderful day including a visit to the Antique Car Museum. Mother got in trouble for not reading the sign and touching the cars (big surprise, there :-) She charmed her way out of her sins and even got to sit in one and have her photo taken. 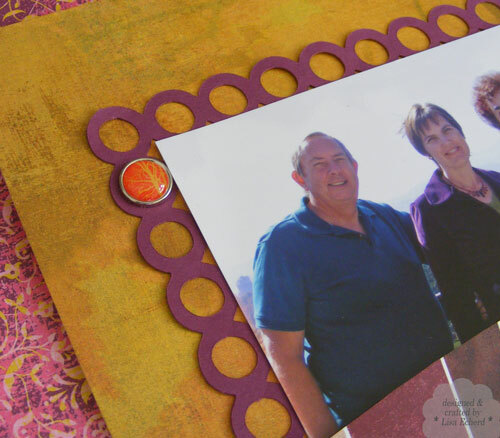 Crushed curry cardstock is the perfect yellow with the Indian Summer papers. To make it fit in with the Basic Grey line, I distressed the outside edges with Vintage Photo distress ink from Ranger. This border was cut on the Cricut. It is just a circular shaped Wingding character repeated over and over and welded together before cutting. I did have to use the Multicut feature to get a clean cut on this detail. I often print my journaling on vellum so I don't completely cover the pretty pattern paper. 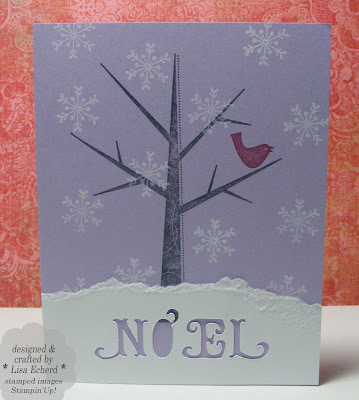 Purple DSP: Razzleberry Lemonade by Stampin' Up! The 'Swiss cheese' background was cut on the Cricut. You could use a Coluzzle or other cutting system that lets you position circles where you want. When I laid out this one in my SCAL software, I set the circle sizes just a tad larger than my circle punches. 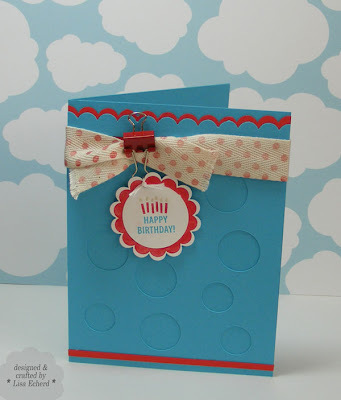 Then I can use the background again for another card and put stamped punch circles inside the holes. I didn't have any Poppy Parade ink was prescribed in the color challenge so I subbed Real Red for the ink with the Poppy paper. Hope you get a chance to try out the Tempting Turquoise, Poppy Red and White combo this week. They are great colors together! Twill tape from Stampin' Up! Here is my first YouTube video!!! I'm so excited having wanted to do this for a long time. Thanks for visiting. Feedback on the video would be greatly appreciated. Ingredients: Stamps: Lovely as a Tree and Home for Christmas by Stampin' UP! Last week I was nagging readers to vote in the mid-term election. This week, I'm asking you to vote in an Internet election that is very easy. You don't even have to leave your chair to cast a vote for the Operation Write Home charity. What is Operation Write Home? 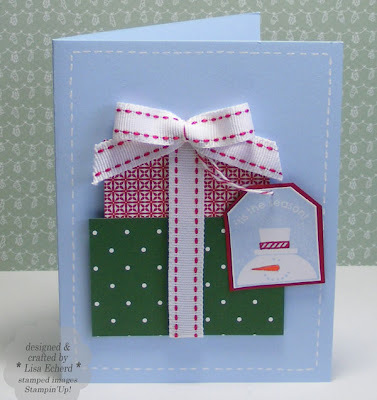 Operation Write Home (OWH) sends boxes of hand crafted greeting cards to military personnel overseas who then select cards to send to their family and friends at home. Think about it like this: There is no Hallmark store in the Afghan mountains or the Iraqi dessert. 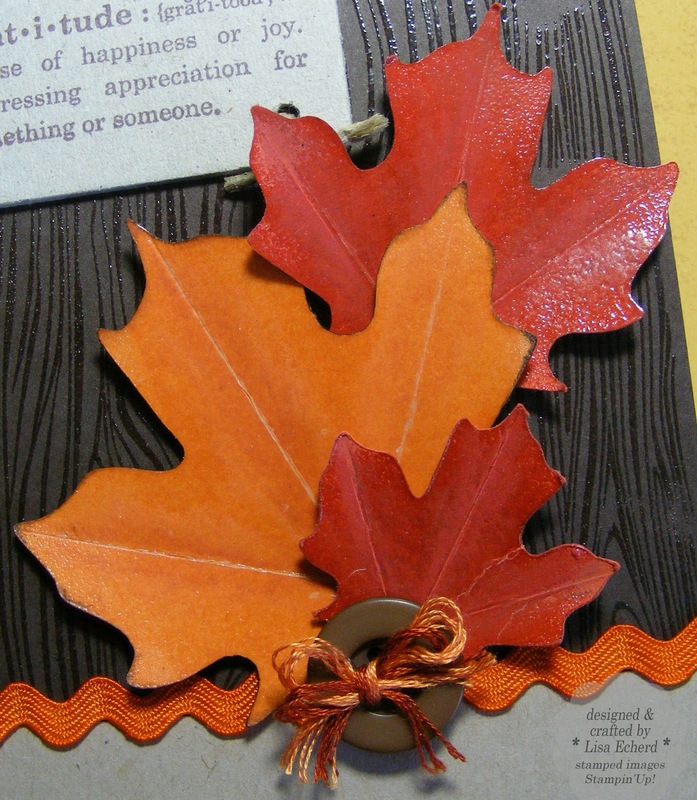 OWH only sends hand crafted cards that are donated by cardmakers from all over the country. I started sending them cards early this year and have sent about 200 so far. I love to make cards and make more than I send personally. It is always wonderful for any of us to receive personal mail - a birthday card, a thinking of you card just out of the blue, etc. But what about those who have loved ones in the line of duty? Wouldn't they appreciate even more having something with a handwritten note from their husband, wife, father, son, grandchild? When I pack up a box of these cards, I imagine how much they mean to those serving in these often desolate locales to see a bright pretty card and how much the card and its sentiment will mean to its ultimate recipient. Cardmakers send their completed cards to one of three shippers in the US. The closest shipper to me happens to live in Charlotte. The shippers then sort the cards, add envelopes, and repack boxes of cards to go to units overseas each week. As far as I know, OWH is staffed only by volunteers. The shippers are volunteers. OWH costs are postage and envelopes. Yet those costs can add up significantly. A couple of weeks ago, they sent out 104 boxes across the world at a cost of $1500. Do that every week and it really adds up. Winning the contest from JoAnn's fabrics would be a huge help to the OWH cause. For more info on OWH visit them at http://www.operationwritehome.org/. 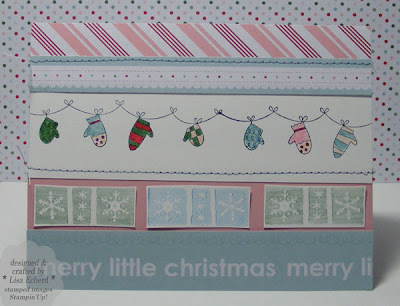 The card above is one of the last I made before OWH Christmas deadline. I used Stampin' Up! Season of Friendship set and cut Noel using the Storybook Cartridge on the Cricut. 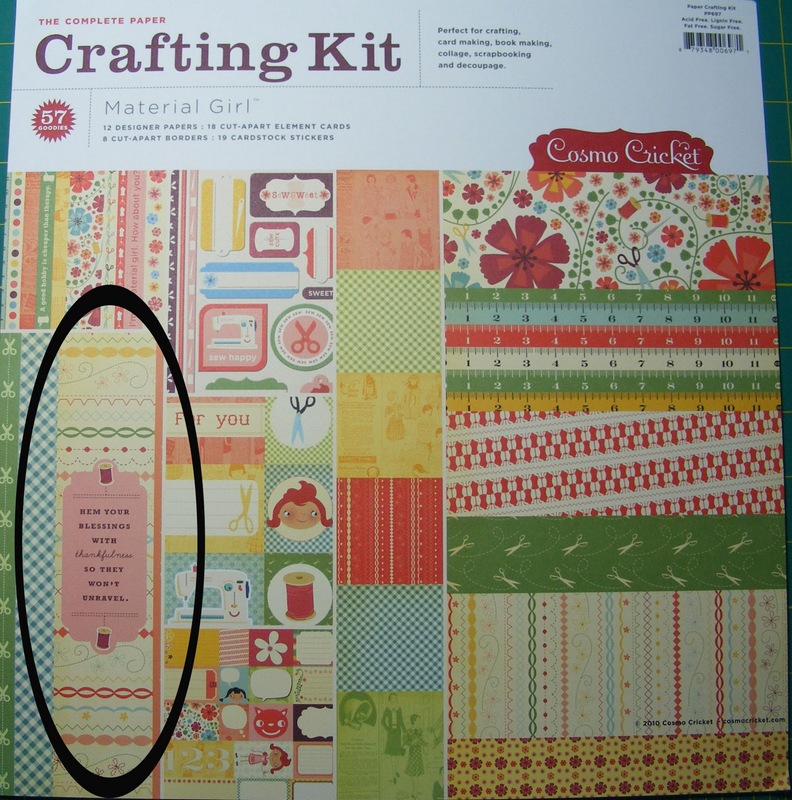 More and more designer paper packs are coming with a sheet of borders. These strips of pattern in varying sizes are great for scrapbook borders. 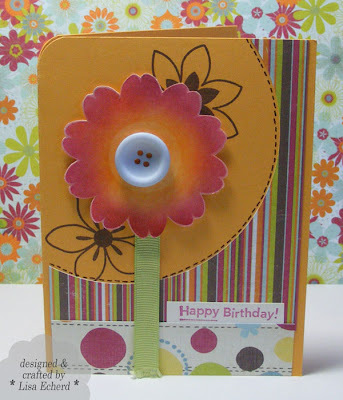 For cardmakers, we can cut them up and use them all kinds of ways. One of the most straight forward is to create a card of strips. I've mixed in strips from this paper from Stampin' Up! with some stamped images and another designer paper in the series. Stitching lines are added for interest. 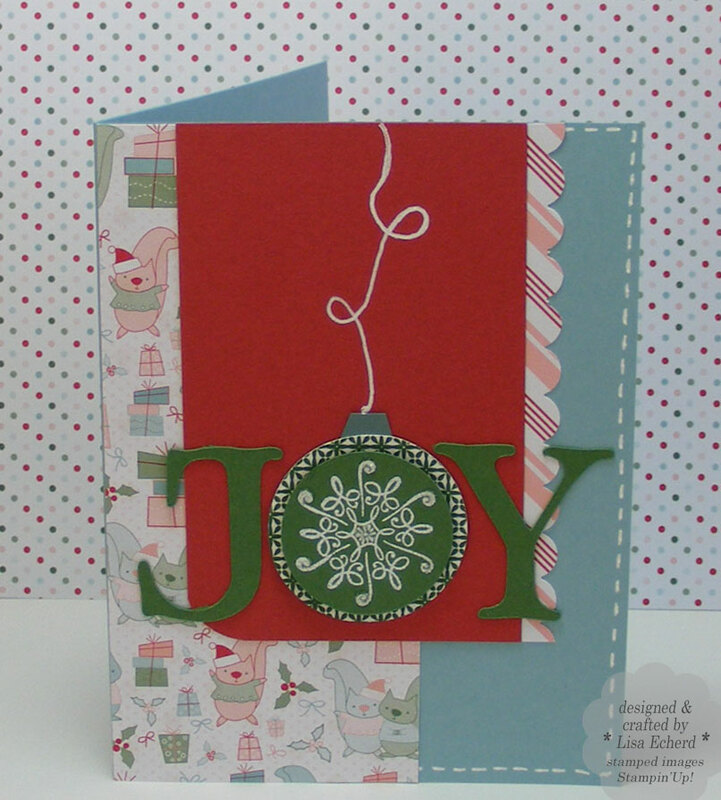 The row of stamped snowflakes is made with one of the techinques from Jennifer McGuire's Thinking Inking series at Two Peas in a Bucket. The technique is to apply acrylic paint to a stamp and then sponge away part of it leaving a streaked appearance to the paint when stamping. The cool colors and theme of this card match the weather here in NC today. As the weatherman said last night, it is more like January than November. Brrr! I'm off to stamp club this morning. Joining friends to make cards will no doubt warm up this cold day. 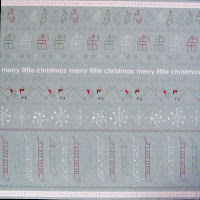 Ingredients: Stamps: Cute Christmas and Suitable for Framing by Stampin' Up! 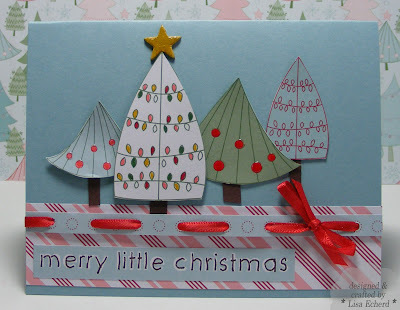 DSP: Candy Cane Christmas by Stampin' Up! It's a miracle! Ok, not really, but it is a record. 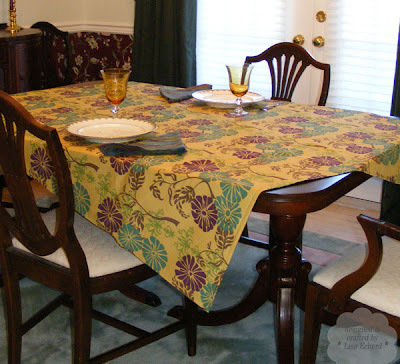 I bought fabric to make something for our house and completed the project within the first month! This is amazing because usually, ok always, the project is conceived, the fabric is purchased and then it sits - for months, sometimes years! I think the average is something like 2 years between purchase and my actually making something for myself. I have some drapery fabric for the dining room that I know I've had a good 4 years. It's gorgeous fabric but no one can see that all rolled up. 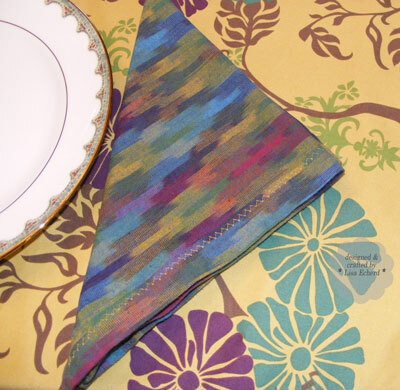 And so I just had to buy some of these beautiful fabrics for a table cloth and napkins. We are already enjoying them because I promised myself these would not sit and wait on me to get to making something for myself. I'd purchased a cookbook that day and along with these fabrics were the momentos I brought home from our trip. Very suitable since we spent so much time eatting wonderful food in Sonoma County. I've made a couple of recipes and then got derailed when the stove died. It is finally fixed. Yippee! 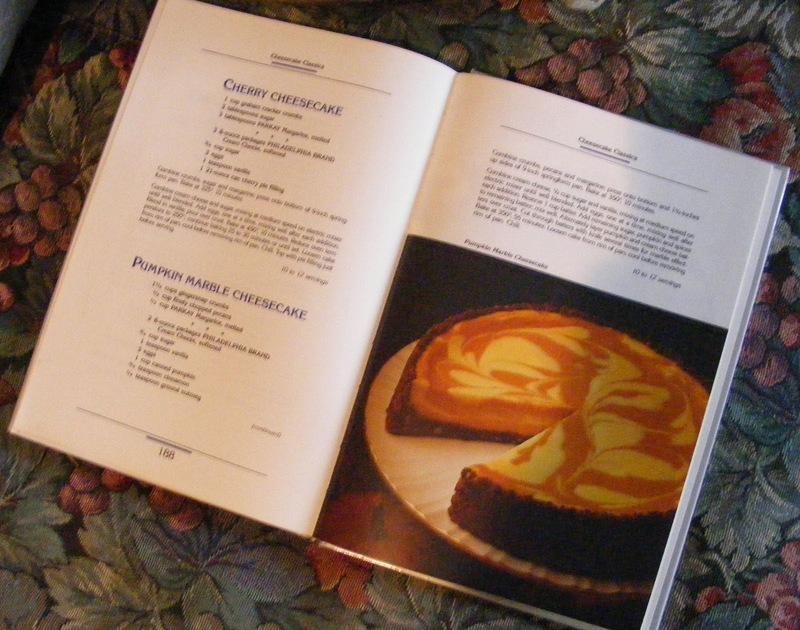 I'll have to pull out the cookbook and see what I was planning to try next. For now, I'm just happy to boil water. Happy Friday! What will you do with your extra hour this weekend? 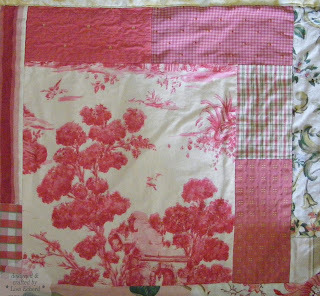 It's time for the Blogger's Quilt Festival. Here's my entry, check the link at the end of the post for more. When I was a little girl, I loved it when samples were discontinued. My parents owned and operated a retail business selling carpet, wall paper and draperies. Imagine all the fun materials I got to play with with sample books and drapery samples were dropped. I used to make my own Barbie doll houses - more functional than intricate - and all kinds of fun experiments. For the first few years of my own window treatment business I would give away discontinued sample books. After I saturated the local school and community college design program with books, I decided to keep some of them for myself. Some of these books had such beautiful fabrics, many that I had not sold but had always wanted to work with. So finally, I started tearing the books apart and using the samples. 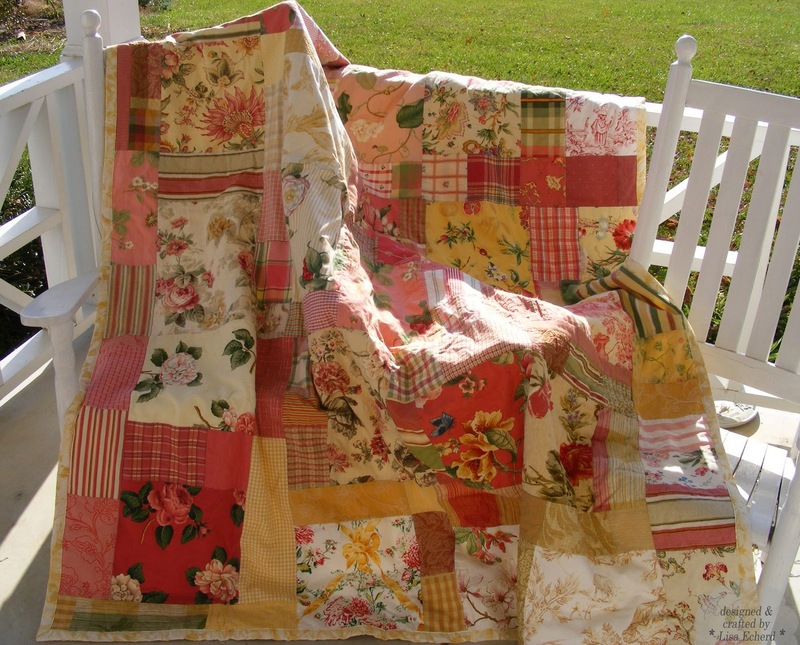 This quilt is one of my first creations with discontinued fabric samples. I just loved the colors in many of these fabrics yet the rose, corals and yellows were often too feminine for clients to use a lot of in their homes so I never got to work with them when they were current. 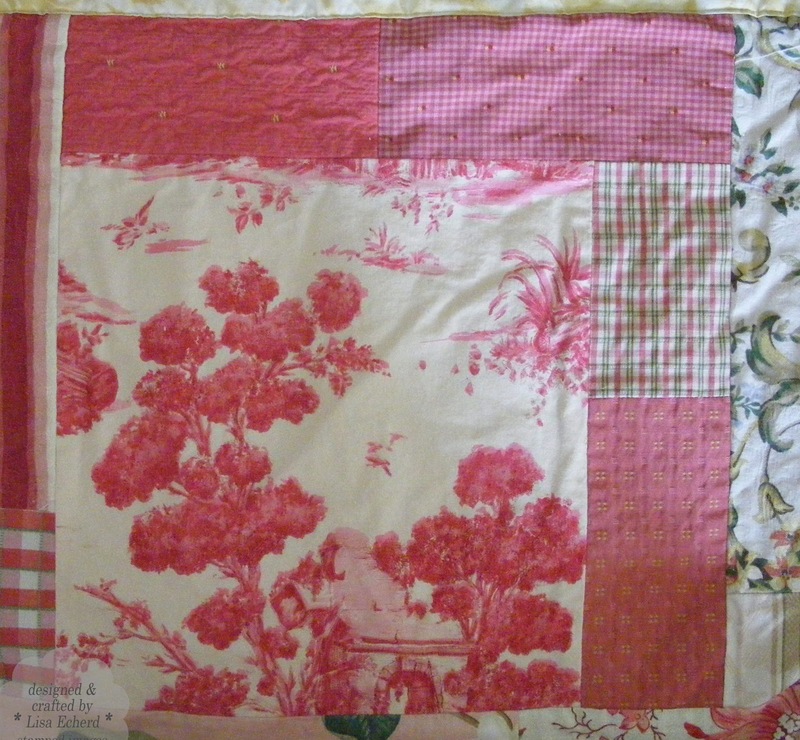 To make this quilt, I raided every discontinued book I had at the time to get enough. I had to buy just a little fabric to finish it out. I started trying to construct blocks but eventually just filled in the blanks as best I could. The patterns were already cropped from the sample book so I didn't want to lose more fabric making a specific size block. Contrary to what I've told customers all these years, you can wash decorator fabrics. I still don't advise it when it comes to window treatments because the fabric and lining will shrink different amount leaving an undesirable result. 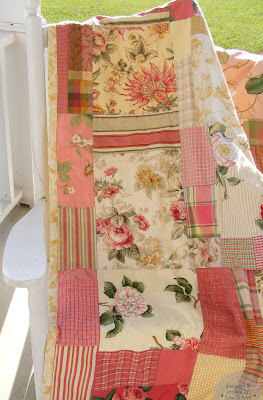 The finish also washes off the fabric leaving too 'soft' a look for a valance yet it is perfect for a quilt. These types of fabrics are a bit heavy so I used the lightest weight batting in the quilt. Also, I tied rather than tried to machine quilt all that bulk. We use this quilt in the winter months and I still love looking at all these pretty patterns particularly these pretty toiles which are now so rare in new samples. Making a quilt with these samples means a lot of hand prewashing and tons of ironing. But the benefits are free fabric (since the books were free to begin with or paid for anyway long ago) and every fabric is unique! Since I did this one about two years ago, I did another last year in black, brown and beige tones for my parents. I continue to save dropped books and every now and then get the notion to plow through them hunting up pretty patterns. As fewer and fewer chintz are being made, less of these opportunities will arise so I'll keep holding onto books and storing up ideas for future projects. 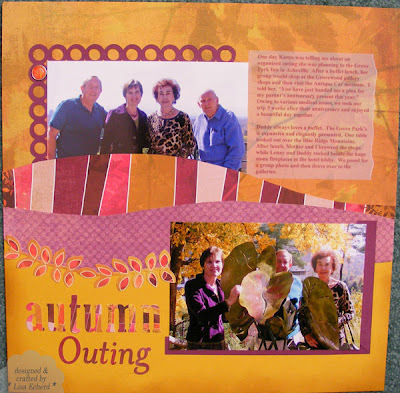 Check out the other entries for the 2010 Fall Quilt Festival at Bloggers Quilt Festival Fall 2010. Thanks to Amy for putting together this great event. For today's color challenge at Splitcoaststampers, Mary asked us to use Cajun Craze, Peach Parfait, and Early Espresso - all new to the Stampin' Up! palette. As new colors, I still don't have all the inks and papers. I don't have anything in Cajun Craze so I had to use Dusty Durango but I darkened it with watercolor and embossing powder so I hope it will pass :-) These colors go beautifully together for fall. I threw in just a touch of kraft (now Crumb Cake) for my neutral to balance the chipboard. Cut leaves with a paper cutting system. I used the Cricut. You could also trim some out by hand. Score the main veins. I used my bone folder and a ruler. This makes the most difference in making them look real. Add some color depth in the vein lines with watercolor crayons in slightly darker shades and a blender pen. 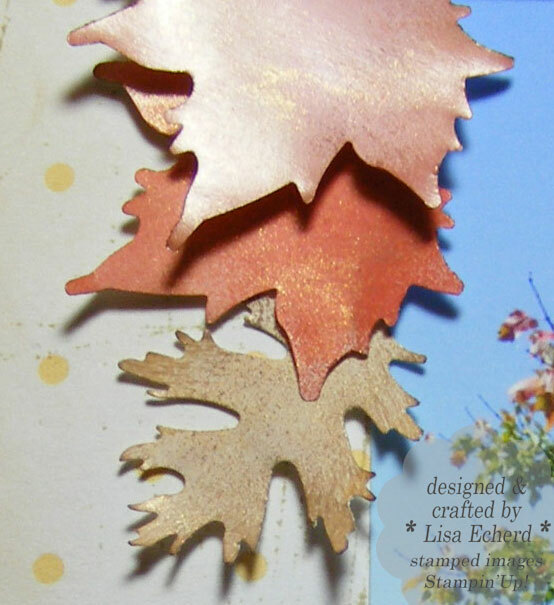 Coat each leaf with Versamark, dip in clear embossing powder and heat. Be sure to use your tweezors! I edged the lighter Peach Parfait one with a little Early Espresso marker. You could distress the edges too with some Ranger ink. 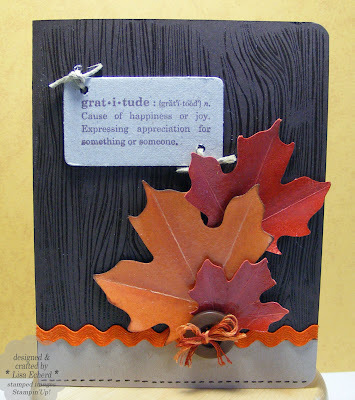 Ingredients: Stamps: Woodgrain by Hero Arts; Define Your Life by Stampin' Up! November. I don't know about you but I'm thankful to have Halloween behind us. I love all these scrapbooking product and technique videos, but I'm really sick of little monster papers and Halloween color schemes. I'm ready for some holly, jolly Christmas! Another thing I think we all want behind is is the mid-term election. Haven't we had our fill of TV ads (many of which don't even say what party the candidate is in - apparently no one wants to be affiliated with anyone this year.) And my mailbox and trash can are filled to the brim with political ads, too. Despite the over exposure of many candidates, they do remind us of our opportunity to vote. I'm a huge voting advocate. If you are eligible, vote! Remember, that there are people all over the world fighting and dying for the opportunity of walking into a voting booth without hassle and casting their ballot. It is a privilege. Honor those who gave you that opportunity. Vote.